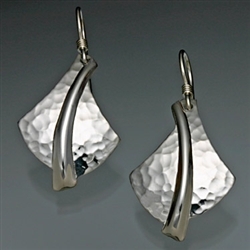 These sterling silver earrings have a beautiful hammered texture outlining the contrasting smooth surface in the middle. The unique shape of these earrings along with the light reflecting qualities of the hammered surface create a stunning set of earrings. These are 3/4" x 1" and come on sterling silver ear wires.